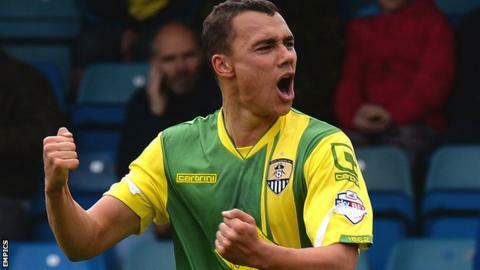 Notts County forward Graham Burke says facing his former club Aston Villa in the League Cup on Tuesday night will be a "massive" occasion. The 21-year-old, who joined the Magpies from Villa in July, played only twice for the top-flight club. Burke told BBC Radio Nottingham: "It's a massive game for the club and it's a big game for the players. "Whichever team they put out on Tuesday will be strong as they have so many good players." Burke joined Villa as a youngster in 2011 and made two substitute appearances in the 2012-13 season in the League Cup, at home to Tranmere and away at Bradford. He had a loan spell at Shrewsbury at the start of the 2013-14 campaign and then joined the Magpies on loan in March this year, before his permanent move. Burke added: "I don't know what team they will field, but whatever team they do put out it is more about what we do and how we go about the game. "That's where everybody wants to be and everyone wants to play, at Premier League standard. "You want to test yourself against that and see how you do against that kind of opposition. "Everyone knows in cup games anything can happen. We just need to go out there and do everything right, you never know what might happen."